I spent yesterday walking round the area west of Penzance in Cornwall. The landscape there is pock-marked with neolithic, Bronze Age and Iron Age remains, one of which is this fogou at Boleigh near St Buryan. Fogous (pronounced foo-goo) are common to many Iron Age settlements in Cornwall and Scotland. They are essentially a deep trench lined with drystone walling, and covered with stone caps. 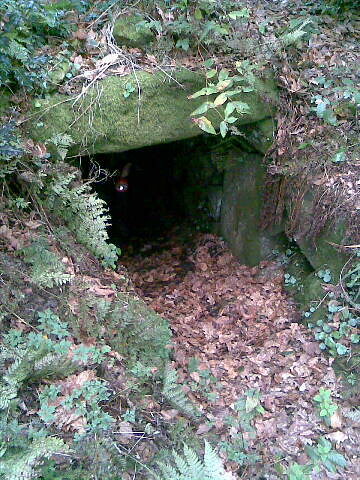 Many, like the one at Boleigh, have a side-chamber as well as the main trench. At Boleigh there is also a carving – now barely visible – of a figure with its right armed raised up, holding an unidentifiable object (perhaps a spear). Nobody really knows what they were for. The three theories are that they were used for storing food; as a place of refuge; or for ceremonial or ritual purposes. Personally I have never been in one that wasn’t damp, which makes me tend to discount the food theory, and I also wonder how effective they would have been as a hiding place given that they were generally in the centre of a community. In the mid-1990s, Time Team investigated Boleigh and found the remains of an early Iron Age house enclosed by an oval wall. They concluded that the fogou there was for ritual use by the house’s inhabitants. In the middle of this barton of Trove on the top of a hill is still extant the downfalls of a castle or treble intrenchment called … , in the midst of which is a hole leading to a vault under ground. How far it extends no man now living can tell by reason of the damps or thick vapours that are in it, for as soon as you go an arrow flight in it or less your candles will go out or extinguish of themselves for want of air. For what end or use this vault was made is uncertain though it is probable it was an arsenal or store house for laying up arms ammunition corn and provision for the soldiers of the castle wherein it stands. In the wars between Charles I and his Parliament divers of the royal party pursued in the West by the Parliament troops under Sir Thomas Fairfax were privately conveyed into this vault as far as they could proceed with safety, where Mr Leveale fed and secured them till they found opportunity to make their escapes to the king’s friends and party. Davies Gilbert (ed. ), The Parochial History of Cornwall: Founded on the Manuscript Histories of Mr. Hals and Mr. Tonkin; with Additions and Various Appendices (London, 1838). Hals started researching his history in 1685, carrying on until his death in the 1730s, so it’s likely that he heard this story either from locals who remembered it, or from the second generation of those locals. If true, it is likely to have taken place in May 1648, when a rebellion focused first on Penzance then on Helston was put down by Robert Bennett and Edward Herle. The latter battle is known as the Gear Rout because it took place near Iron age fortifications at Gear Camp. A number of men under the command of Mr Bogans of Treleage in St Keveme. .had… .posted themselves in a most advantageous position at Gear… with an apparent determination of defending that important pass. But the Parliament troops advancing, and showing themselves in much greater force than was expected, Major Bogans’ men deserted him without coming to action. Some betook themselves to the Dinas, the greater part dispersed, and Major Bogans himself fled to Hilters Clift, in St Keverne, and concealed himself in a cave in the rocks. Richard Polwhele, The History of Cornwall (1803-08). Another account also says that survivors “were lurking in ye cliffes and in Tinne pitts” a week later. So did royalists really hide out in the fogou? Or is it more likely that a story from slightly further up the coast has become attached to the Boleigh fogou over time? If you’re interested in seeing the Boleigh fogou, it’s on private land so prior permission to visit is needed from the landowner. 1. Mark Stoyle, ‘”The Gear Rout”: The Cornish Rising of 1648 and the Second Civil War‘, Albion, 32, 1 (2000), pp. 37-58.